Love at First Flight, the debut novel by WA-based physiotherapist Tess Woods was released as a paperback in August this year, but not before garnering thousands of fans all over the world as a digital release. The novel follows Mosman Park GP, Mel, who appears to have the whole package. She has a great job, is married to an anaesthetist who people frequently describe as a Greek God, two gorgeous teenagers, and lives in a big beautiful house in one of Perth's most elite suburbs. Yet as the book opens, the reader is given a glimpse of Mel's inner life. Something is missing. She just doesn't know what it is yet. Then, on a flight to Melbourne to have a girls' weekend with her best friend Sarah, Mel meets Matt. He's younger than she is, but the attraction is instantaneous and mutual. As the plane touches down at Tullamarine, Mel releases that her entire world has flipped upside down. 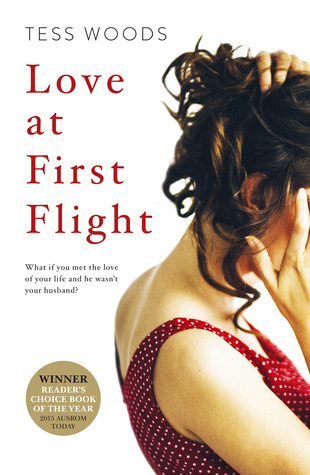 Love at First Flight has hit the ground running, with the book not only being an e-book bestseller; it is also the first and so far, only, book that Harper Collins has printed after an initial digital only campaign. It was the winner of the 2015 AusRom Today Readers' Choice Book of the Year Award. But let's get one thing straight-- this is not your typical romance novel. When I spoke to Tess Woods on Wednesday night at the Bassendean Memorial Library, she was quick to point out that this isn't technically a romance novel at all. According to those in the know, a romance novel is ALWAYS told from the point of view of the woman alone (this book tells the story from both Mel's and Matt's perspectives), they never have infidelity in them, and they always end in happy ever after. Love at First Flight is what then? In an age where the books which make the biggest splashes frequently borrow elements from many genres, pushing the boundaries of what has been published before, perhaps the distinction isn't even important. What matters is that readers cannot get enough of Tess Woods-- and the good news is they won't have long to wait, with Tess hinting that her next book should be out mid to late 2017. As someone who tends not to read a lot of romance, and rarely ever reads books which are quite this racy (to put it lightly), I was caught up in the emotional complexity of this novel. At it's heart, Love at First Flight is the story of Mel's awakening-- and of the difficult choices she has to make. It is a moral story, and while some readers have been upset by the book's content, I found the plot to be not only realistic, it was profoundly moving at times. The two elements of the novel which were strongest in my opinion were the setting and the points of view. Love at First Flight is a story which could have happened anywhere, but it happens in Perth and it happens in places I have been-- places which are not only recognisable at face value but feel authentic as well. As for the narrators, I was struck immediately by how different the two voices were, and how real the male perspective felt. As a novel which takes all of it's punch from it's plot, this was a heartily enjoyable romp, and impossible to put down. A Little Life it was not, but it was the perfect book to escape a busy weekend with and I can see why thousands of readers all over the world have connected with it. I gave this book 3.5 out of 5 stars.